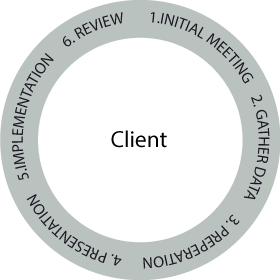 We offer whole of market research to enable us to find the best solutions to help our clients meet their objectives. We use sophisticated software tools to research and compare products, funds and providers across the market. We consider costs, features, performance, customer service, tax situations to satisfy ourselves that we are offering our clients the very best advice to suit their individual needs and provide evidence of our conclusions. We will present our proposals in writing and detail our understanding of your objectives. We will explain how our recommendations will help you achieve your goals. If you are happy with these strategies we will proceed with the proposals. This may involve setting up new protections plans, new investments and sometimes re-arranging some of the plans our clients already have in place. For those who may have received financial advice in the past, or even managed their own affairs we often find that clients may need a sounding board and want us to review your existing arrangements. We offer a comprehensive review service which can analyse your existing plans and/or investments and make suggestions on how to enhance your current provision. This may involve making recommendations to maximise tax efficiency, reduce costs, diversify your holdings or simplify your arrangements.